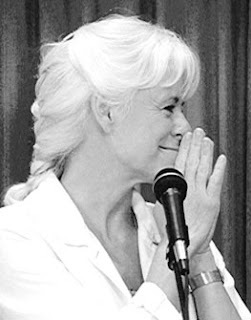 This weekend one of my favorite satsang teachers, Gangaji, is in town. She is very special to me because Gangaji was the first teacher I heard that told me that what we are searching for is already here, as Oneself. That we are what we are searching for. Akshara and I met her through our landlords when we moved to Crestone, Colorado in 1997, just after we married. We had to move out of our rental home in Nederland, Colorado because it had been sold. We spent three weeks looking for another rental, yet we literally could not find another home to live in. One day, we were driving around Nederland, looking for rental signs, when we both looked up into the sky and saw the crescent moon appearing in the blue sky. We turned to each other and said, “Let’s go to Crestone”. The crescent moon made us both think of Crestone at the same time. We had just visited Crestone on the way home from our honeymoon in Ouray, Colorado. Crestone is a very remote town, at the time having a population of less than 100 people, filled with several spiritual centers from many traditions. There is a Tibetan Stupa, a Catholic Carmelite Monastery, The Haidakhandi Ashram devoted to an Indian Teacher named Babaji, The Savatri House, which supports the work of Sri Aurabindo, a Zen Center, a Native American Center and others. In addition to the centers, the town is overflowing with healers, visionaries and people that live a very sustainable lifestyle. Many of the homes and structures built there use alternative energy sources and recycled materials. When we visited Crestone on our honeymoon, we felt an immediate connection, yet, in our minds, there was no way we could live there. What would we do for work? There was hardly a grocery store and people there seemed to do either construction or some sort of home business. Well, after the synchronistic moon event, we decided to give it a try, since by this time we were living in our car. We left for Crestone that night and arrived very early the next morning. We parked near the local store and as soon as it opened, we bought the Crestone Eagle, the local newspaper, in search of ads. There was only one rental ad in the paper! We felt that it would be a miracle if it worked out, yet we called the number anyway. We had to at least be open to the possibility. Akshara called the number and the man he spoke with was very kind and welcoming. He invited us over immediately and we met Al and Yanni Drucker, the owners, at the rental property. They said they would love to rent the house to us but they had made an agreement with another family to let them have a few days to think over if they wanted to rent it. The next day was the deadline. So, we would need to wait a day and see if the other family was going to take it. If they didn’t want it, the Drucker’s said it was ours. We felt very grateful that we were next in line, but the rest of the day we were very anxious. We drove down to the Great Sand Dunes, which were spectacular, and spent the night in a hotel in Crestone. We prayed a lot that night, asking for the home to be ours. It just felt right to be there. Crestone immediately felt like home to us. The next day we called Al and he very enthusiastically told us that the house was ours! So we invited some friends to move down with us to fill the extra rooms, and we spend a very interesting year there. We played music, practiced qigong, worked in the Drucker’s garden and spent time in nature, which was easy because 14,000 foot mountain peaks were literally in our backyard. We found odd jobs that kept us going. It felt like a true retreat from the hectic world. One day, while working in the Drucker’s garden, which I did every morning, (I picked, washed and delivered organic lettuce to the local restaurant) Al came out with 3 video tapes. He asked if I had ever heard of Gangaji. I replied that I hadn’t. He said that he thought we would enjoy her. I took the tapes, feeling an excitement about them for some reason. After finishing in the garden, I went home and told Akshara about them and we immediately put one on. There are moments in life in which you know life will, from that point on, never be the same. This was one of those moments. Gangaji spoke so clearly, so from the heart and so simply. Her message went right into the core of my being. She stopped me in my tracks and I realized she had given me the answer to a question that I truly wasn’t even conscious of having, yet it had been within all along. It was the end of the search for true fulfillment. Akshara felt the same way. Our roommates also enjoyed the tapes over the next few days, yet for Akshara and I, it was different. We felt very connected to her in a way that cannot be articulated with words. Al was happy to hear about our connection with her and continued to give us tapes throughout that summer. One day, he came out to me in the garden and said that Gangaji was going to be coming to Crestone in a few weeks. I was delighted to hear this. We went to see her at the public meeting and truly enjoyed seeing her in person. She was there for an entire week, doing a silent retreat, which we did not attend, but we could feel her presence in Crestone and immensely enjoyed that experience. I spent some time in silence that week on my own as a way of connecting with her and her teaching. Since then, Gangaji has been a huge part of our lives. She has held us in difficult times and in joyous times, and has helped both of us deepen into the truth of our nature as peace and stillness. We have attended many meetings and silent retreats over the years, and have gratitude for being able to be with her in New York, California and Maui. I feel very connected to her; she holds a sacred place within me. As I write this entry, Gangaji is here, in Boulder. Yet during this visit, she has taught me something different, something unexpected. We were planning to attend the public meeting on Friday night. She is doing a weekend retreat, yet it was too much financially for us right now. But we were excited to see her on Friday. Unfortunately, Friday ended up being cold, wet and very snowy. We had a very big spring storm move in, which brought 3 feet of snow to the mountains. Here in the foothills we got a few inches because it kept changing from snow to rain and sleet, but we were not willing to travel through it, so we decided to stay home. That night I felt some sadness and some regret about not being there and seeing her, yet I knew that somehow it was perfect in it’s own way. I decided to take a bath and listen to a recorded meeting with Gangaji. During that meeting, she spoke of several things that I needed to hear in that moment. One thing that really struck home was when she spoke to a woman who came up and said that she didn’t feel a desperation in seeing her anymore; that it had fallen away. For her, it was more about just being there in a simple way and not needing anything from her. Gangaji replied that yes, when the student is ready, the teacher is irrelevant. That there truly is no separation and when the student realizes this, and that the teacher is always present as one’s own heart, the physical teacher is no longer necessary. In an instant, these words settled into the core of my being and I felt a light radiate out, from Itself, to Itself. In that moment, nothing else was needed and I knew that this was satsang with Gangaji and that the distance between us didn’t exist. Having this experience on Friday evening with Gangaji was so valuable to me. Sometimes the teaching is in the not getting, at least in the seemingly not getting. The mind sees things in limited ways at times and when it lets go, nothing is not just right, all is perfect. All is calling us; all seeming obstructions, all seeming miracles, All.